hahaha, I love the brush stroke! The ideas that you come up with are brilliant. Haha ! That was genius ! omg i got the brush stroke in 10 sec it was so funny! i shall get Pink to teach me the brush stroke. This one was WAY adorable. this is amazingly cute and clever. I paused and was like …how is he doing what? And looked again…and then I realized how clever it really was haha. I’m way slow at 6:15am, after not sleeping yet. 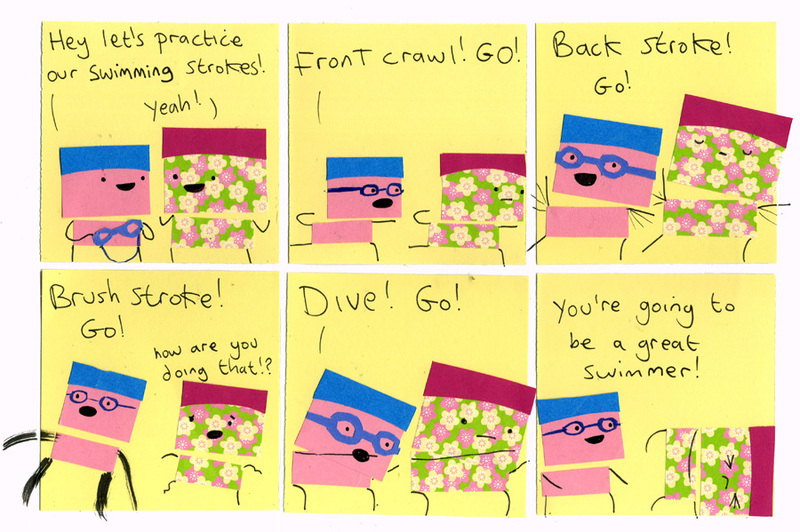 Haha.. You got the front crawl and the back stroke, then you replaced breast stroke with brush stroke.. what about the butterfly stroke?